We fancy huh? Well a tad. Today’s recipe is SOOOO delicious. 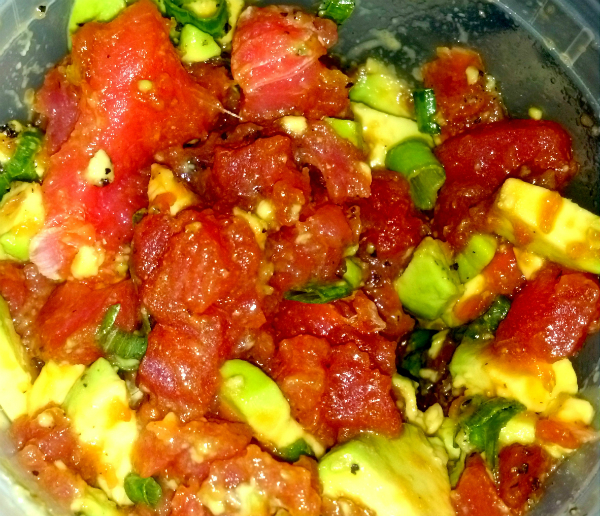 If you have never had tuna tartare basically it is diced sushi grade tuna that is mixed with seasonings. I made some tuna tartare for lunch the other day and shared with co-workers and they were in LOVE. So here is the recipe. Dice your Tuna into cubed pieces and dice your avocado into cubed pieces as well. In a mixing bowl combine your tuna and avocado. Pour in 1 ½ tablespoons of sesame oil and 1 ½ tablespoons of soy sauce. Add ½ of tablespoon of Sazon seasoning and ¼ tablespoon of pepper. Chop your scallion stalks and add to the mixture. Mix everything till all pieces are evenly coated. Let sit and your refrigerator overnight and serve the next day. This is DELICIOUS! I hope you enjoy!